Boost your subscriber list up to more than 300 by using this unique self destructing Tell A Friend Bonus Script! Tell A Friend scripts are easy to implement, but to date there's not much out there that can determine that your site visitors are not keying in some bogus emails just to get to the bonus page. 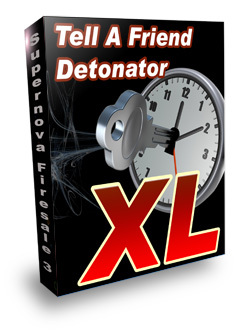 If you want to maxxed out on the list building potentials of ANY of YOUR websites, then Tell A Friend Detonator XL can perk up you sluggish list in less than 24 hours! While some have only scratched the surface by using Tell A Friend Scripts to promote their sites...nothing comes close to this... because you see, most of the Scripts available, acts just like any form to email scripts where there's no way to tell if the visitor is keying in real email addresses that will really click on the link. And I mean REALLY click...zero email frauds by the visitor because Tell A Friend Detonator XL has a smart built in function that will never allow the visitor to cheat the system by keying into the tell a friend form a bogus "friend's" email just to get to the bonus.....in short, there is no way that the visitor can download the bonus unless the referred clicks were made from another friend using another computer! Your visitor happens to visit your website where he finds this great bonus that you are offering for free...absolutely free and difinitely irresistible. And by using Tell A Friend Detonator XL, you are able to make sure that the he refers real email addresses. If your visitor's refered friends do not visit...your website through the link, within YOUR defined detonation time....he will lose his bonus. Set A Viral Effect Of Powerful Sneezers: Some people are far more likely to spread an ideavirus than others. Malcolm Gladwell (author of the brilliant book and ideavirus, The Tipping Point) calls this the Law of the Few and will enable you to amplify your Viral Marketing. Become a Super Affiliate and get top marketers pay you top dollars because they know that you have a huge responsive list! Convert more leads into ready buyers and loyal customers! Fully deter SPAM attempts by using the Detonating Function of Tell A Friend Detonator XL! No MySQL needed....Its as easy as pie to install, just upload and install.. This particular program can run on most servers that supports PHP. This program has been tested on Linux and Windows and does not require any database. Don't waste another day of wondering how much you can really make by having Tell A Friend Detonator XL! Order Now! Think about this, for a measly $17.95 today you can be on your way to having your very own multiplying subscriber list right now and making money for you in the next 72 hours! This is a small sum to pay, to start finally taking steps towards getting your online business running and starting to live the work at home lifestyle! Look at it this way -- $17.95 is really a painless drop in the bucket to be able to get your hands on Tell A Friend Detonator XL and start using it right away to improve your lifestyle! Don't you owe it to yourself to try Tell A Friend Detonator XL today?